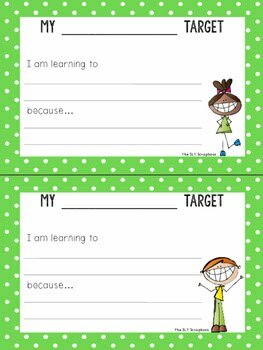 These generic learning target posters are suitable for use in classrooms or therapy sessions, and are great for helping students to keep track of what their individual targets are! This freebie includes 8 x half page colored target pages and 4 x half page black and white target pages. They're written as "I am learning to... because...", with space to fill in the topic, the target and the reason why they are working towards the target. These are suitable for posters to put on display, for students to have on their desk during lesson, or to be sent home, so parents know what their child is currently working on. This is a no prep freebie- just print, have students write out their targets, and you're done! This freebie is for individual, personal use, by you, in your classroom/therapy sessions only. You are free to print off your own copies to use with your students, but please do not sell, share or claim as your own. If you want to link to this product, that is fine to do so, but please let me know either via the blog, Facebook or email- thesltscrapbook@gmail.com.